2017 is already turning out to be a bad year when it comes to losing wrestling legends as we have now lost a true icon in George “The Animal” Steele at the age of 79. The sight of George Steele’s green tongue and “eating” wrestling ring turnbuckles was iconic in the “Rock n Wrestling Era” and George fit right into that new era even though he had already had a long and storied career by that time. George was a huge star in the 60s and 70s as a wildman bad guy that regularly challenged for the then WWWF Championship against the likes of Bruno Sammartino, Pedro Morales, and Bob Backlund. Many may not realize that before becoming “George Steele,” Jim Myers was a school teacher and coach in Michigan and continued those roles well into his wrestling career. In fact Myers originally wrestled as a masked man labeled “The Student” to hide his identity. After establishing himself as The Animal, Steele continued to work around his school schedule while still wrestling in high-profile matches It wasn’t until Vince McMahon Jr.’s national expansion that George was actually wrestling full-time. In the mid-80s, the wildman became a “good guy” as George Steele switched sides with manager Captain Lou Albano and began a legendary feud with Randy “Macho Man” Savage over George’s “crush” on Miss Elizabeth. The feud lasted over 2 years and spanned over numerous “Saturday Night’s Main Event” broadcasts and even a featured match at WrestleMania 2. The feud also lead to Steele playing a role in the legendary match between Ricky Steambaot and Randy Savage at WrestleMania 3 where Savage finally lost the Intercontinental Championship. After his retirement in the late 80s, Steele was hired by WWE as an agent and could even be seen occasionally on TV back then breaking up a brawl or something similar; George held backstage roles for many years but would still pop up in wrestling roles even on WCW Nitro and TNA, and numerous RAW episodes even in recent years. You may also remember George from the big screen as he famously appeared in the Tim Burton film “Ed Wood.” George has also continued to appear in WWE video games and merchandise in recent years, showing just how much of an impact The Animal had throughout generations in the wrestling world. If you know of George Steele’s work, you know he was a one of a kind character that sadly we don’t see much of today; a wildman that truly made you wonder if he really was crazy or even fully human a times. 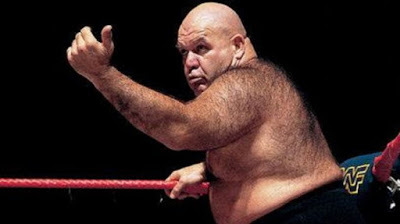 During the glory era of wrestling when you had a hero champion that took on all challengers, George Steele was a beast that was the perfect unpredictable enemy. As a good guy, George brought out the exact opposite emotions in fans that wanted to see him win Miss Elizabeth and overcome the dastardly Randy Savage. While not the most technical wrestler in the world, pro wrestling was made better by crazy unpredictable brawlers like George Steele.